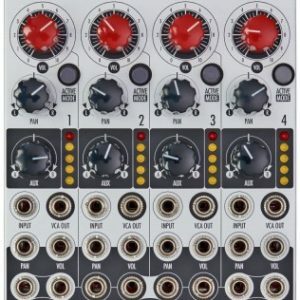 In a minuscule amount of space, the Scan & Pan provides a unique 4 channel mixer with voltage control of level and panning. 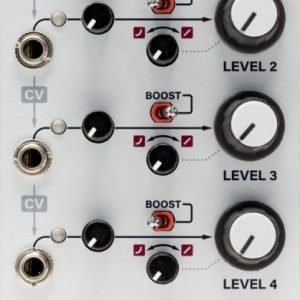 Since the level control was already there, the “width” and “center” controls from the Harmonic Oscillator are included to allow the user to Scan across the channels, fade between them or actively mix them together. It’s signal path is all discrete transistors. 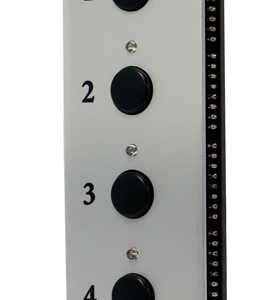 Each channel has a mono input and a gain control. 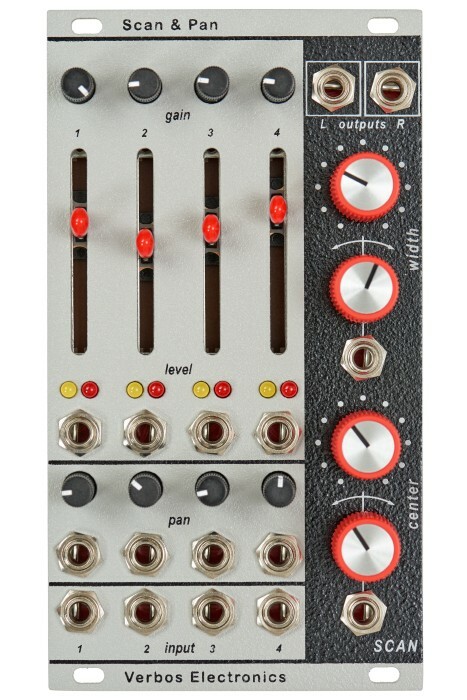 The level can be set manually with a fader and modulated by a CV. 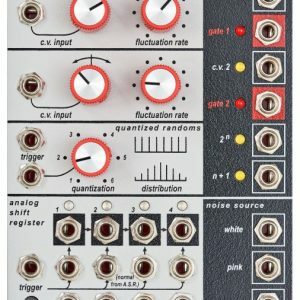 Furthermore there’s a panning function with a manual potentiometer for determinig the channel’s panorama position and a CV input for modulating it. The “Center” parameter is used for selecting a channel, while “width” also selects the adjacent channels. For instance if channel 2 was selected with center control and remain static if is possible to fade in and out chennels 1 and 3 (or even 4). It can be interesting to use this function with different wave forms of an oscillator but also with totally different signals. It can be even more exciting if the channels have different panorama positions which means the channels which are faded in appear in different stereo field positions.